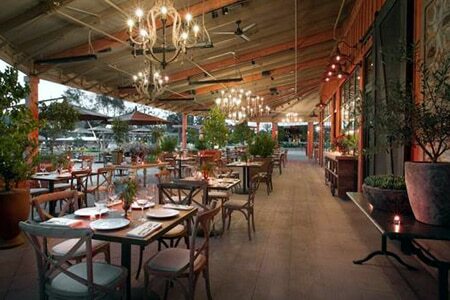 Orange County’s farm-to-table pioneer creates seasonal contemporary dining amidst a charming botanical setting. : Roger’s Gardens in Newport Beach has long been known for being a paradise for gardeners and admirers of botanical beauty. It’s also home to this rustic yet refined restaurant. It fits right in with the surroundings, as its light-wooded interior and spacious outdoor patio effortlessly extend the property’s casual-chic vibe. More importantly, though, the restaurant serves as the home base for Rich Mead, the veteran OC chef who’s been locally curating the farm-to-table motif since the concept was in its publically perceived infancy. Mead’s constantly changing “field to fork” menu captures the zeitgeist of the culinary calendar through gently composed expression, from starters like the Gorgonzola and Granny Smith apple salad with candied pecans and dried cranberries to the Chinese sausage accompanied by dried shrimp, sprouting broccoli and kimchi. Mains such as the roast spaghetti squash with cilantro pesto and braised greens and the must-have grilled Dijon soy pork tenderloin with Parmesan potato cakes highlight Mead’s devotion to sourcing ingredients from trusted purveyors. Desserts rotate by season as well, and a cheese plate is always an option at meal’s end. The wine list is a mix of well-known and boutique labels, and there’s a bevy of craft cocktails to enjoy.